On the last day in Fiji, it was still pretty rainy. 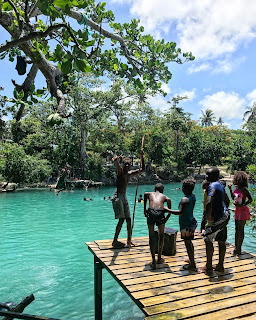 Since our flight over to Port Vila, Vanuatu was at 2:30pm, we had to leave the hotel at noon time, so there wasn’t much time to fit in any activities. For the first time on this trip, I managed to get up early enough to get some buffet breakfast at the hotel. They had a really nice dining area with a lily pond in the middle and some outdoor seating area as well. There was a coffee & tea station, cereal station, toast/pancake/waffles station, fresh juice station, salads & fruits station, and a bunch of other cooked foods like sausages, bacon, and eggs. I was prepared to get the most out of this, but was defeated after just 2 rounds. Nonetheless, hotel buffet breakfast is always amazing. 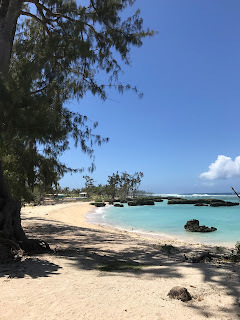 After breakfast, I went down to the lawn and beach front are of Sofitel and did that cheeky run with a flag slow-mo video for instagram and my new Facebook profile video. I think it took about 5 takes to get just the right one, but I’m really satisfied with the shot. With around 30 minutes left to go, I emptied my entire luggage to rearrange things. Somehow my luggage got heavier, but I think it’s because I’ve swapped my winter(ish) clothes for summer wear and now my jacket, sneakers, long sleeve everything needs to go into the checked bag. 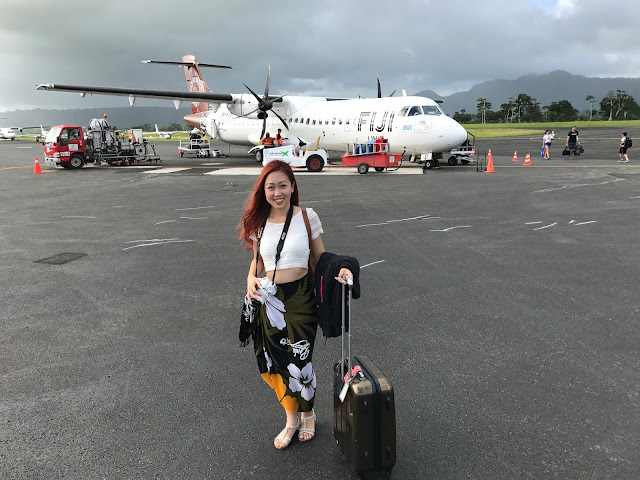 We arrived at Nadi International airport shortly after 12pm. The cab ride was around $45 Fijian dollars (divided by 2 is USD), not bad I’d say for a 20 minute ride. The airport was under an upgrade construction, so workers were wheeling out carts of concrete and bricks here and there. There was no problem checking in, and security and customs was really quick and relaxed. There were 8 gates for the terminal and a pretty good selection of duty free shopping. They had most of the alcohol, makeup, magazines you’d find at a western international airport, which was a surprise. 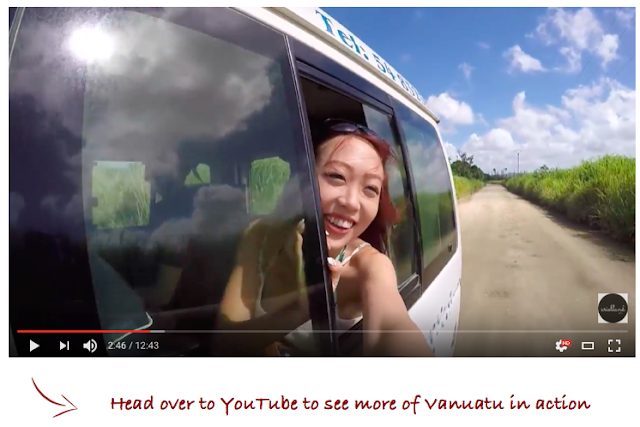 I guess Fiji does market itself for tourism quite well and need to cater to a lot of international visitors. Our flight was delayed by about an hour, probably due to the heavy rain. I was about 60 odd pages deep into my Trans Siberian book when the electricity went off at the airport. I just felt it because the nearby Christmas tree twinkle went off, but the ceiling was glass so there was still light coming in. The lights came on shortly, and our plane also arrived. It was a small propeller plane with probably around 15 rows of seats, still managing to have “business class”. Just as we were announced to board, the electricity went off again, and back on. I was worried for a second they’d check us in by manually going through a list! Rain was pouring down as I descended down the stairs onto the runway. The Fiji Airway staff handed each of us a large umbrella to shelter ourselves from the downpour. We boarded pretty quickly, after all there’s just 15 rows to fill. Still, somehow I manage to bump into Cantonese and Chinese sitting right in front and behind me, sandwiching me into the middle. No offense, but I’m slightly annoyed because they all talk really loudly. I’m here on vacation and I'm being forced to listen to languages that remind me of where I live and work, really not pleasant. 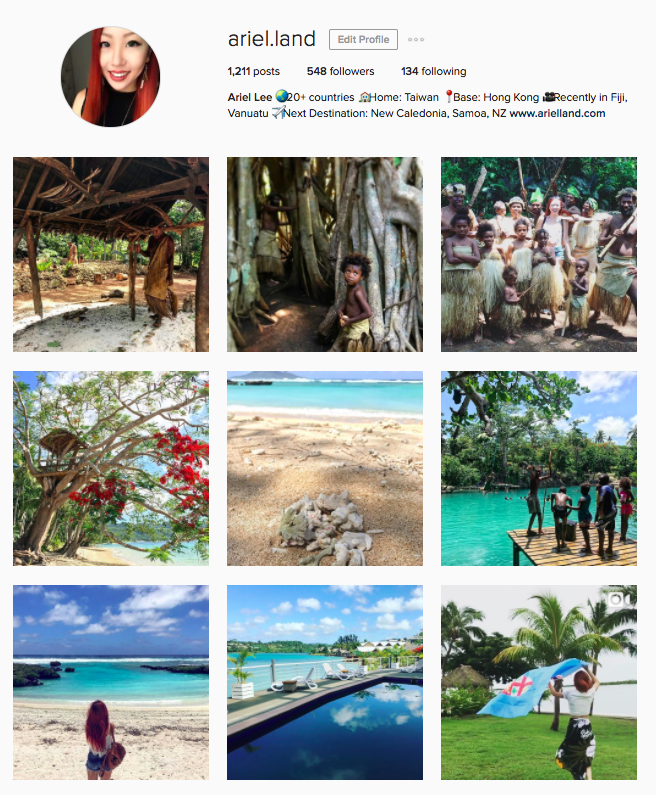 I would think that no one Chinese would even think to go to Vanuatu, but I guess not. I’ll just have to find a way to tune it all out. The flight was lovely, nothing bumpy or scary like what you’d imagine a propeller plane to be. It flew just like a large turbine plane. Once we ascended passed the clouds, I finally saw the sun which was seriously lacking these past few days. Soon the flight attendants started serving us refreshments. Fiji airways is pretty generous and gave us a sandwich with some kind of salad inside, a coconut chocolate bar, and some watermelon. If you were flying on a 2hr flight in the states, you’d at best get a small bag of peanuts, and in Asia you’d get a tub of mini Haagen-Dazs ice cream. 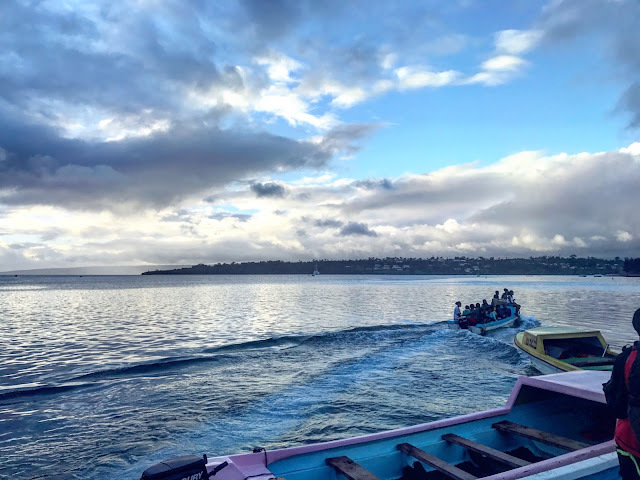 As we made our decent into Vanuatu, you could see the blue green coastal waters of this beautiful country. 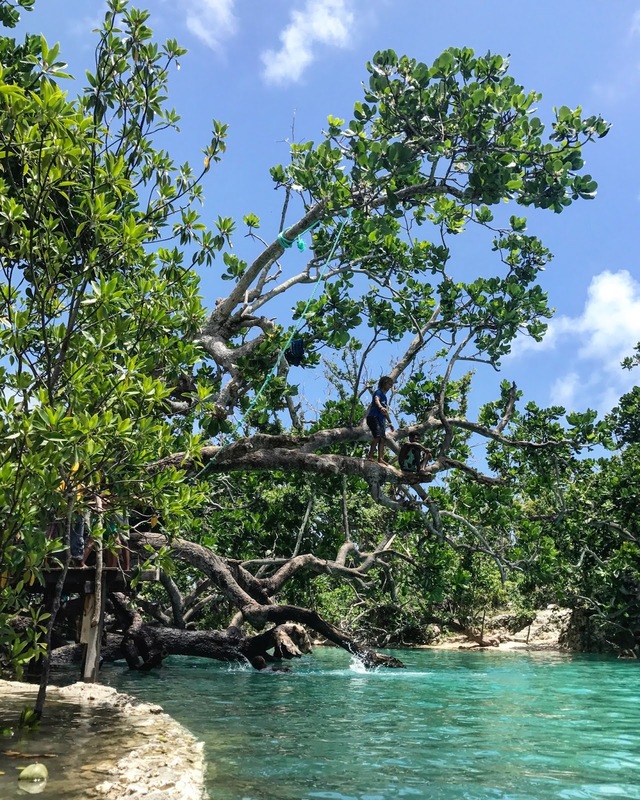 Vanuatu is famous for it’s blue lagoons and stunning blue waters, and you can definitely see that from the sky. The plantations here seemed more gridded than the ones in Fiji. But the best thing – it’s sunny!! And again, immigrations was quick, luggage was also quick, and customs was super chilled. Despite the delay, we are on schedule. 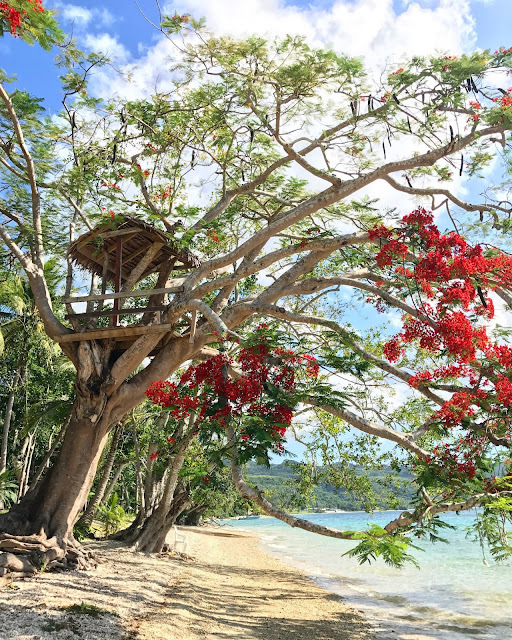 The main island where Port Vila sits on in Vanuatu is called Efate. 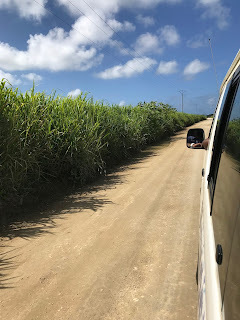 There is just one highway that goes around the island, which takes about a 2hr drive to complete (or 1.5hrs if you speed, and there are no speed limits here in Vanuatu). 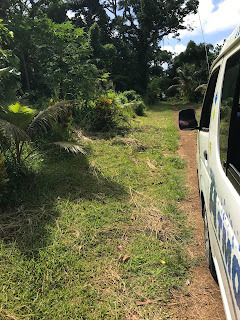 The drive from the airport to the hotel was a $1,500 Vatu taxi ride, which is about $15 USD. The currency here is very similar to the Japanese Yen. We’re staying at Chantillys on the Bay, which is just a 10 minutes walk into town. The hotel room balcony overlooks the bay area which is again this mesmerizing blue green color. The room had it’s own kitchen, including a stove, microwave, fridge, and tea kettle. You could tell this place wasn’t built by a westerner, but still it’s amenities are pretty good for the price. After settling in and unpacking a little, we head to town to get a feel of everything. Most shops close early, around 5pm local time. Sunset came soon around 6:30 – 7pm. 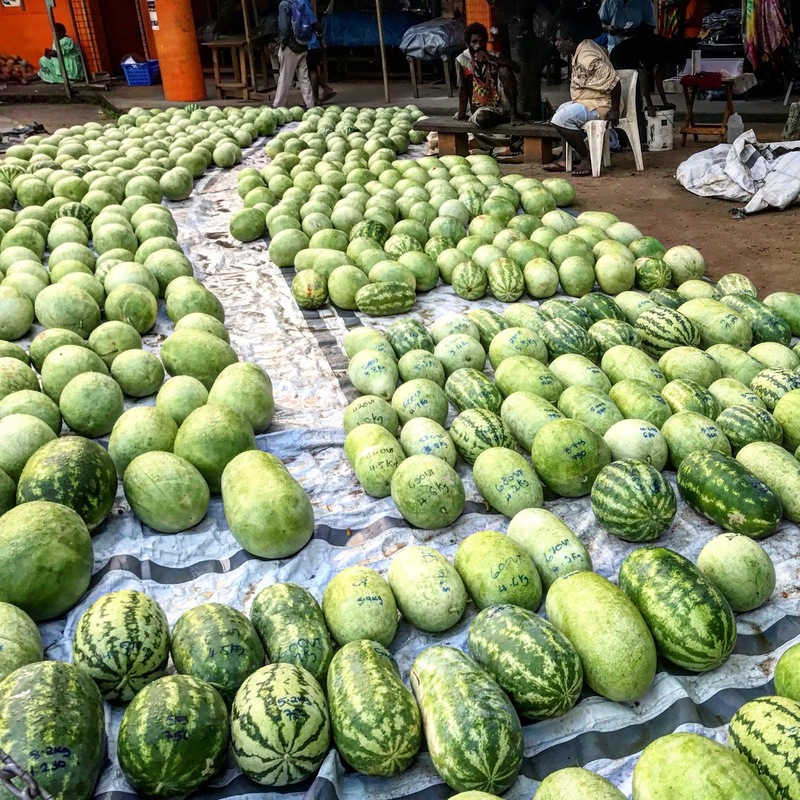 There is a small stretch of road where it is still busy with people, mainly near the 24hr outdoor fruit & veggies market. Along the way there, there are some restaurants near the shore, tucked away. It’s hard to find, but trip advisor will give you good tips, look for the top 20 restaurants. Across from the outdoor market, there is also a supermarket. There you can stock up on water, snacks, and any toiletries. What is amazing is, the price is all wack. There must be some taxation problem. But some chocolate bar or biscuits can cost as much as $5 USD. I have no idea how the locals afford it, but apparently they only go to supermarkets once every 2 weeks. Above the supermarket is a restaurant called “Chill”. It’s airconditioned, has wifi, and the view is amazing. Although they serve mainly pastas and pizza, it’s popular among the locals, so the food must be pretty decent. We decided to grab a bite there. I highly recommend the garlic bread, it was delicious. Back at the hotel, I received an e-mail that the originally booked waterfall trip was cancelled due to weather (actually, not enough rainfall so that the waterfall is dried up). In replacement of that, we booked a tour for the next day with Atmosphere Tours for an round the island tour. Good thing I did my homework in advance. It will turn out to be a really incredible tour, more on that later. The sun is out! Actually out for the whole entire day, no clouds, and no patches of rain. We made a booking online with Atmosphere tours last night at 11pm for this Round the Island Tour. Island, meaning Efate Island, where Port Vila is on. Originally I had booked the Lolomia Waterfall tour, however it was cancelled due to “bad weather”, later the guide Pascal called and explained that it was because there was a prison break for an inmate sentenced to 35 years. Safety first! So around 8am in the morning, we gave the Atmosphere tour guys a ring, and they were on their way to pick us up at 8:45am. Unbelievable efficiency! On the agenda in today’s Round the Island Tours are: a visit to Iarofa village (South), swimming at the blue lagoon (South East), lunch at a secluded beach near Eton (East), visit a collection of WW2 items from the US and Australia (North), WW2 US base (North), and driving by Lelepe and Hat island on the West. We make a full circle around the island’s only highway, built by New Zealand and sponsored by the US government. Justin, our guide pulls up at 8:45, along in the van was the driver and another (very shy) apprentice. And that was it! A private tour, woo hoo! 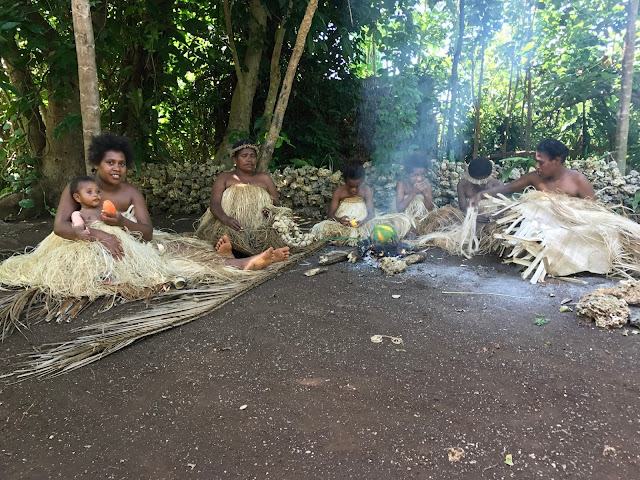 As we drove by different areas on Efate, Justin would tell stories about the different tribes, and the current inhabitants of the area. 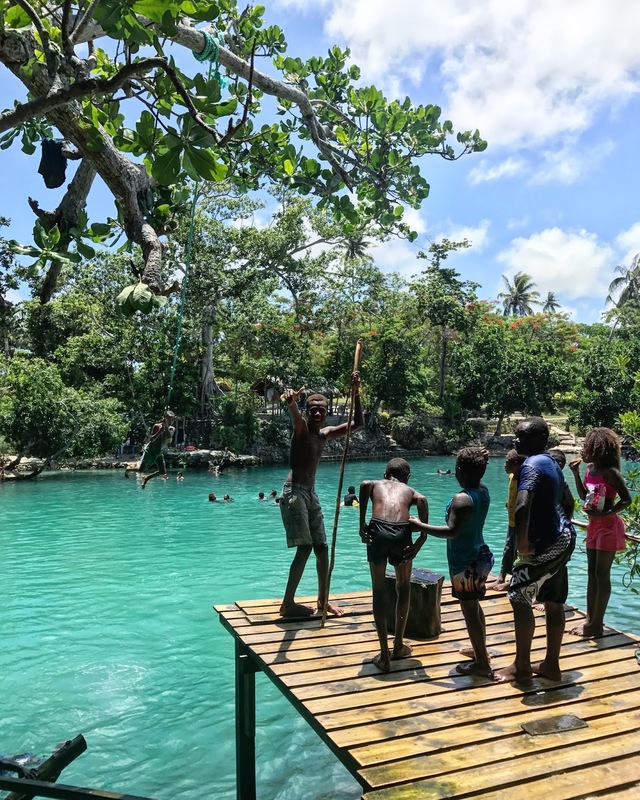 Vanuatu is part of the Melanesian Island groups along with Solomon Islands, Fiji, New Caledonia, and Papua New Guinea. There are over 130 villages each speaking their own languages. These islands all have similar origins and can somewhat understand each other a little. But they have varying traditions for growing beards, dreadlocks, or how one qualifies to be a warrior. 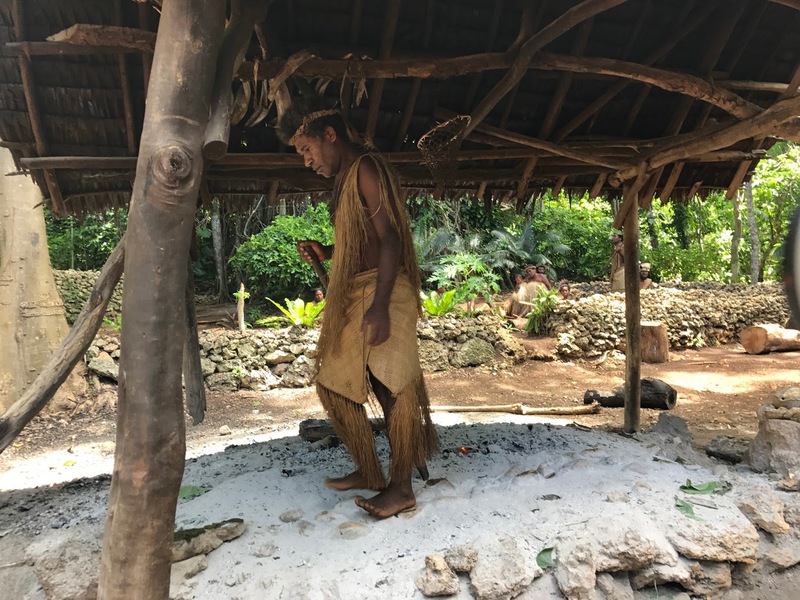 In recent years they discovered some skeleton on Efate island dating back around 3,100 years ago. There were axes found as well but the stones on these axes were originally from South East Asia (Malaysia & Thailand region). Seems like there were some early travellers well before the missionaries arrived on this island. We continued on the main highway for about 30 minutes, then made a right turn onto a dirt road. The further we drove, the taller the grass and the denser the trees were. We arrived at the small village of Iarofa. There are only about 30 inhabitants here, so it’s a tight knit group. The entrance of the village was gated. At the entrance there was a Namele leaf placed at the gate. Some villagers were watching curiously through the trees and bushes. One started to shout and then the chief came out. He held up the Namele leaf as a sign of peace and opened the gate to the village. The chief spoke somewhat good language, and gave us an introduction to the way of life in this village. He had a net and a spider about the size of my palm. The spider sat on this fishbone shaped branch with a net woven at the end of the Y shape. He explained how people caught fish, how the wives taught the children to weave, make fire and food. He also talked about how prior to Missionaries coming to this island, there were no bananas here. 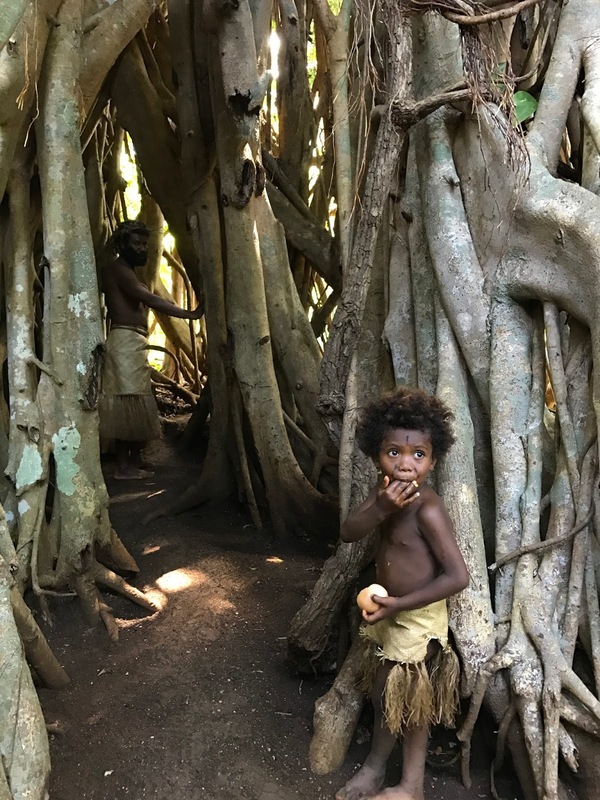 Vanuatu were a group of islands full of Cannibals. But once they discovered bananas, a much tastier alternative to human flesh, soon they stopped cannibalism. Well, I think it was a bit more than that, but I can imagine how bananas would taste better than raw human flesh. Some of the women in the village were preparing food. One was a small leaf with coconut wrapped inside. They also have a way to preserve bananas if a tropical cyclone were to come. I can’t go into every single detail, but this 1hr village visit was packed full of new learnings. 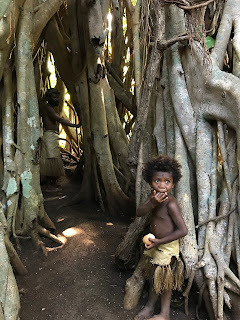 In the middle of the village was a very large Banyan tree. You could walk through the trunks of it, and this is where villagers hide if a big storm were to hit. Walking through the Banyan tree was a big flat, almost gathering spot like place. The chief was to perform the firestone walk. These stones came from another island where Mt.Yasuar is – a volcanic island. 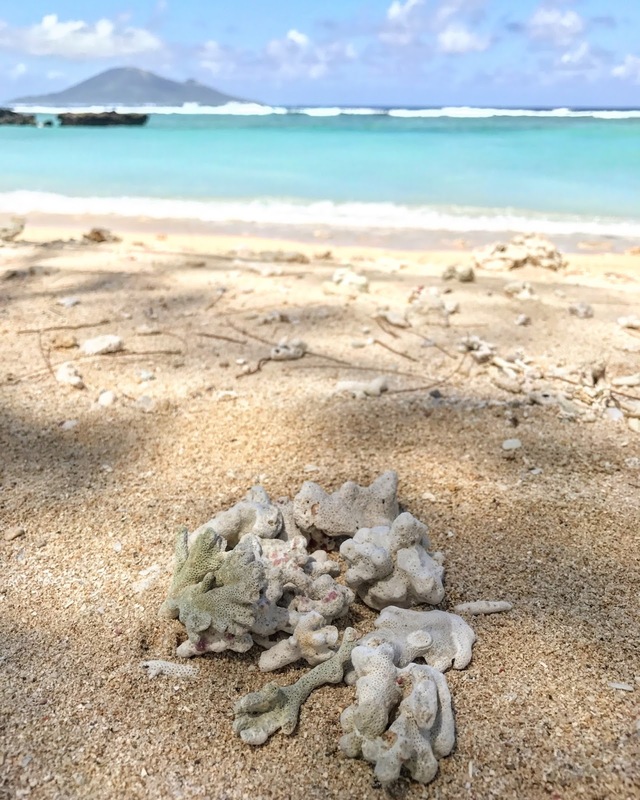 Most islands in Vanuatu are either Coral or volcanic, but Efate was coral. Dig a meter deep into the ground and all you find is coral. The village men heated up the stones with fire, and then one villager prepped the chief’s feet with this chewed up leaf mixture. Honestly this would not protect you, only the first step and the rest is all in the mind. One step wrong and you get blisters all over your feet. The firestone walk is a tradition whereby men are considered as warriors once they achieve this. The chief made 2 rounds back and forth, and ended this walk by pouring some water onto the stone. It let out a loud steam and immediately evaporated. This is just one of the ways one becomes a warrior. Our tour said in his tribe, you are sent as a group into the mountains to catch wild boar. The first to catch a wild boar with a curled tusk is the warrior. After Iarofa village, we continued around to the East side of the island. 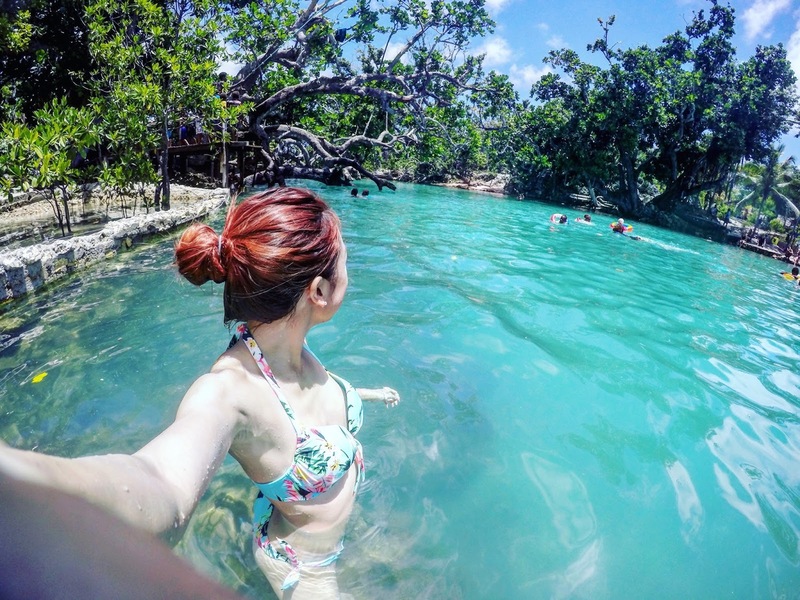 We ended up at a place called Blue Lagoon. Whoever owns this place is probably pretty well off. I couldn’t tell if it’s salt water or not, all I know is the blue is so special. It’s like an aqua color, but up close it’s pretty clear and you can see inside the water. Within just 1 meter in it became much deeper than I could stand. 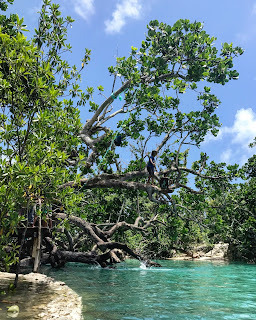 Some local kids were jumping off a vine from a platform into the water. Our driver chopped up some fruits (bananas, watermelon, mango, and pineapple) as some light refreshment, and soon we were back on the road again. We were supposed to visit a school, but it’s closed so we just drove by. This tour group has been operating for just 5 years and are already ranked as #3 on trip advisors for things to do in Vanuatu. They also sponsor these schools and that's why they take people to visit them. We also talked about the National Sport in Vanuatu, it’s not rugby, but soccer instead. And our guide’s favorite teams? Real Madrid, Bayern Munich, and Manchester United. 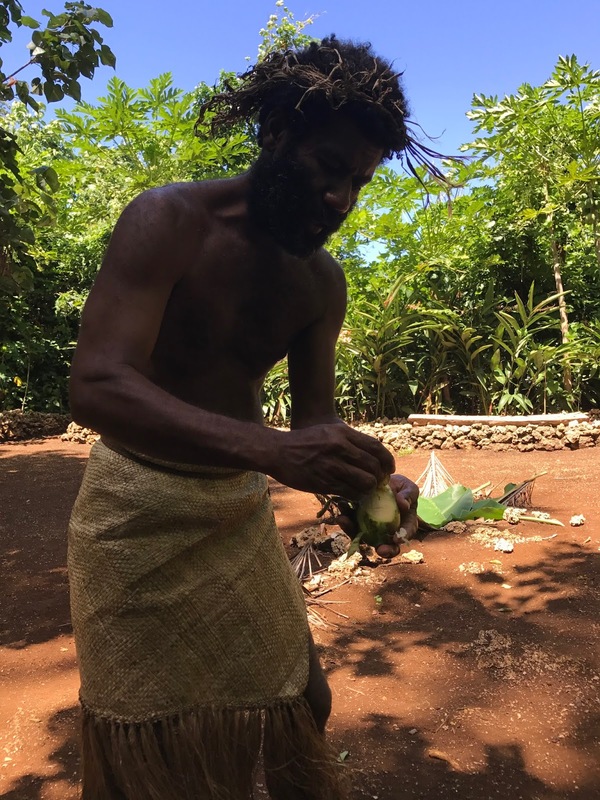 He said that the people in Vanuatu drink so much cava, which takes out the fat in their bodies that they’re all skinny, so rugby isn’t a big sport. The Vanuatu national ruby team didn’t qualify for the World Cup so they are just touring Australia or New Zealand to have a good time. We are now on the South Eastern side of Vanuatu. There are still no water pipes, and further up east there’s no electricity. People grew crops to maintain life on their own. They also keep chickens, pigs, and cows as livestock, and dogs and cats as pets. Cats were used to keep mice away on the fields, and dogs were used to catch wild chickens or boars. There were a lot of coconut plantations here on the east side. Some are owned by American investors who lease the land. 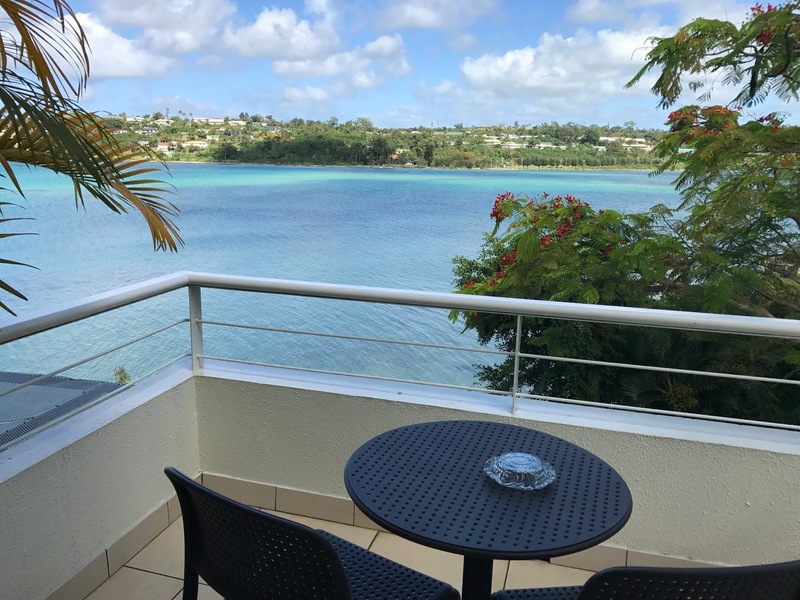 Land in Vanuatu has a maximum lease length of 75 years. Just coconut oil alone sustains 20% of the electricity on Efate Island. The rest is 70% from diesel and 10% from the Windmills. On the East side there’s also a stretch of white sand beach called Eton beach. Here, each family or village has their own beach and they profit from public visits. The money is collected and then later used for celebrations such as Christmas and Wedding parties. We stopped by one of the beaches for lunch. There was no one there other than a 2 man guitar + Ukulele band and the cook. 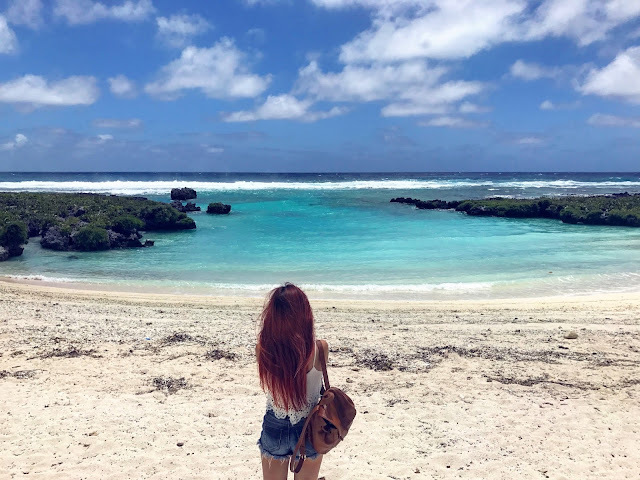 It was a quiet beach with big waves rolling in the aqua blue ocean. The food was simple, some rice, chicken, cooked banana, local spinach, and lemon juice. The best thing about this meal was the stunning view, Ukulele music in the background, and the sounds of the waves in the distance. After lunch we continued onto the north of the island. There is a stretch of the highway which is pretty straight, and there’s an interesting story behind it. 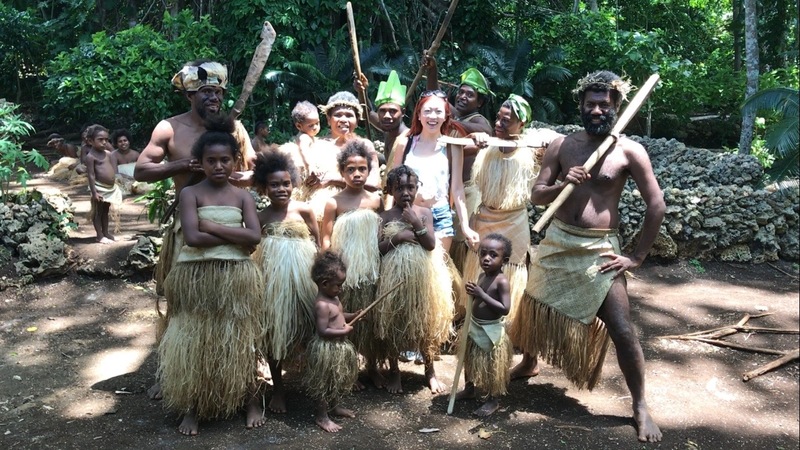 Vanuatu used to be governed by both Britain and France until it gained independence on July 30, 1980. One major difference between these two countries is on the side of the road they drive on, so there used to be a lot of clashes n the past. One day they decided to race on this straight road, evidently the French won so now the entire country drives on the right side of the road. The Americans also had significant influences on Vanuatu as they had 15,600 soldiers deployed on this island during WW2. They introduced this vine that grew like weed to hide weapons on mountain sides. Unfortunately now this vine is growing like an epidemic and the US government has yet to come up with a solution on how to remove it. 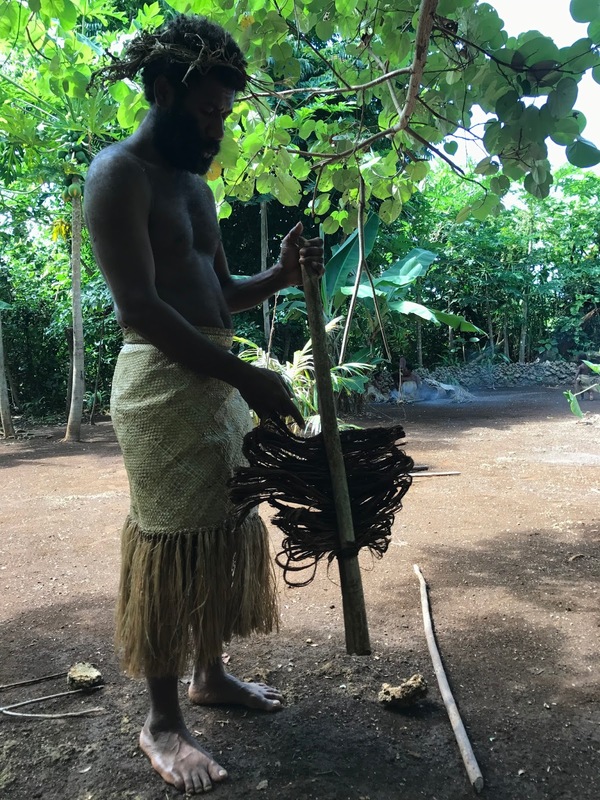 One good thing about the Americans occupying Vanuatu is that they provided working opportunities. People here preferred to work for the Americans because they were given nice uniform to wear, they were fed well and paid well. We visited this small on road-side museum full of collections of items from the 1940s. There were many coke bottles from the states. 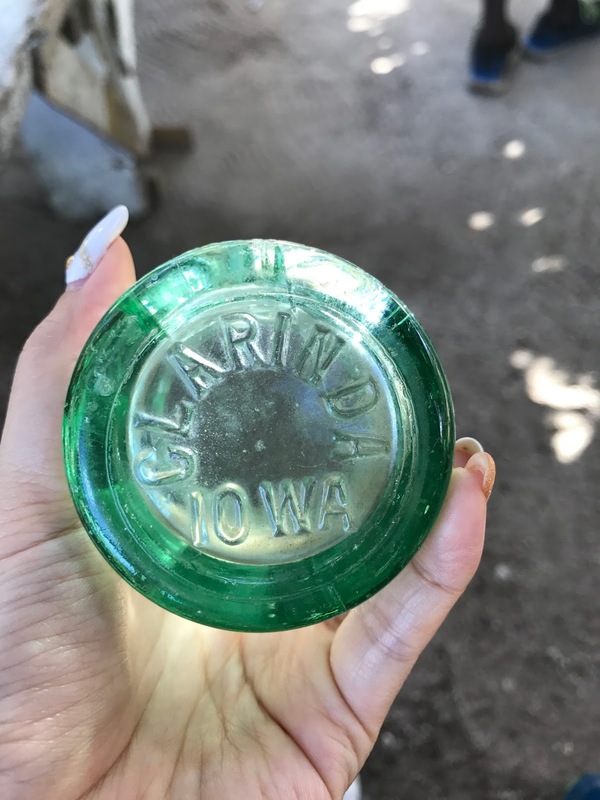 It was back when the bottom of the bottles had names of cities from many states. I found one from Spokane, Washington, and also one from Iowa State! Pretty cool that it’s all the way over here in the South Pacific. From the North of the island, to the west we didn’t stop too much. We passed by Lelepa Island which we’re going tomorrow, and beside it hat island which is a UNESCO World Heritage site. The chief of this island was buried there with all of his 10 wives (life burial). As we drove across small villages, you can see people washing clothes at the river, people walking around with Machetes, almost everyone had one. It looked scary at first, but then you realize, every single passerby waved at the car with a big smile on their faces. The machete was simply a very useful everyday tool that everyone had. Villagers are even given one for their birthdays once they are old enough, and they continue to get bigger machete upgrades. 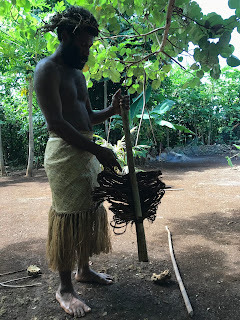 The crime rate here in Vanuatu is very low and they are still using the same prison back from the French and British colony times. The most common crimes are shop lifting, and adultery. Man, if I saw a dude walking on the streets in the states with a big machete, I’d flee for my life, let alone greet them. Last stop before we head back to town was near Port Havannah, right across from Lelepa island. This was a small café/restaurant by the shore. There was a big Hibiscus tree with enormous red flowers blooming over the seashores. 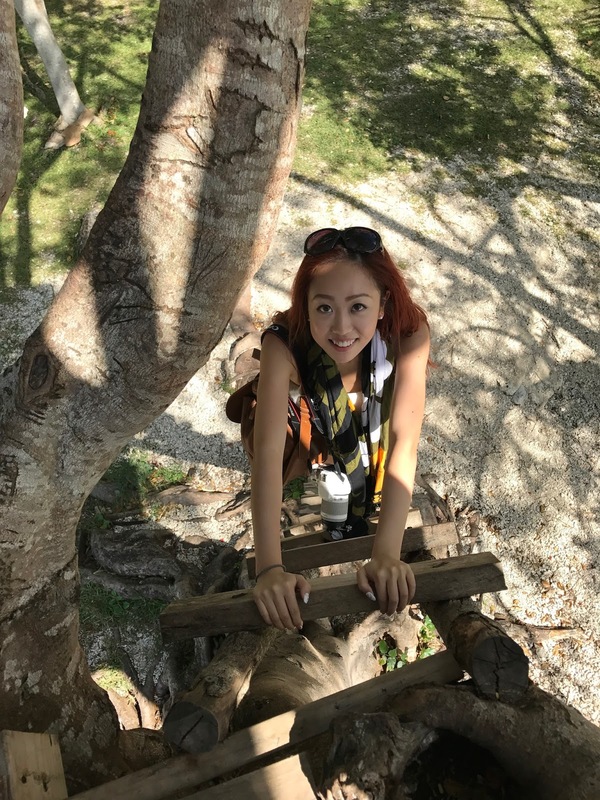 Up on this big tree was a nice little tree house. The scenery looked like out of a movie. There were only 4 people on this beach. The water was lukewarm and crystal clear, the sun was shining, what better way to spend the afternoon? Today’s tour was probably one of the best tours I’ve taken on a vacation. It’s a very well rounded tour with heritage, culture, history, beautiful beaches, mountainous scenery, and an amazing guide. It costs $7500 VT which is around $75 USD which is not bad at all. I can now see why this tour company is ranked #3 on Trip Advisor. I’ve learned so much about one country in such a short amount of time. 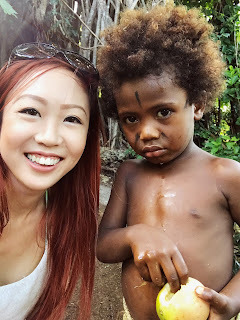 I’ve also learned to fall in love with the friendliness of the people here, and I just love how hard they try to preserve their way of life here. It’s still just the beginning of this South Pacific trip, but I know I will most certainly miss this. 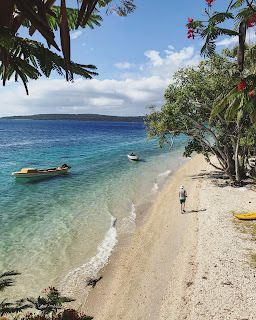 Next up: I head to Lelepa Island, west of Efate main island in Vanuatu. It's home to just one village, and a spectacular spot for snorkeling.